I’m on the verge of serving you better through launching a new website. It’s taken bursts of creativity which made me think of what you could learn from a wildly creative story involving a new take on an old tradition, the can-can & big surprises all around. But first, think of a situation where you need to amp up your creativity then, sit back, relax, put your feet up & think about how you can apply some of the lessons below. This is a true tale of two wildly different groups & how I brought them together. 23 years ago I had a brand new wedding ring on my finger & the sun had set on a glorious West Coast day. 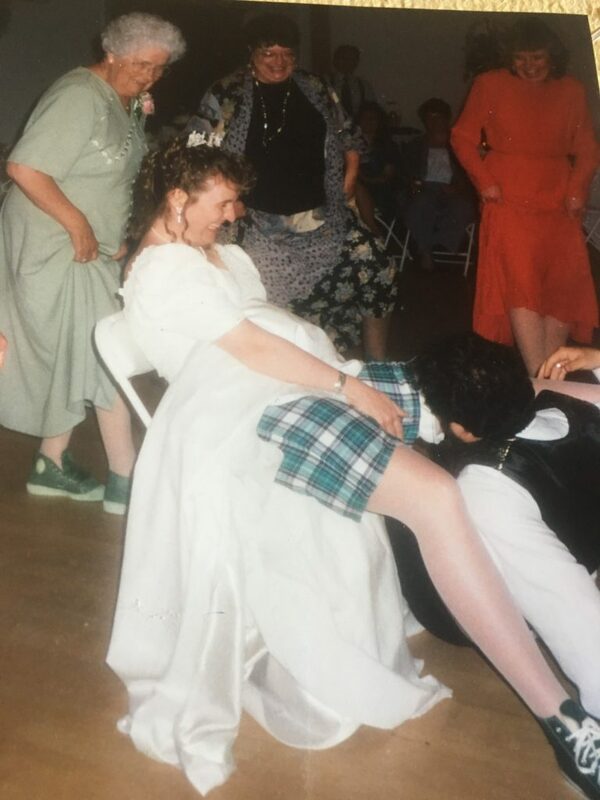 I’d married my honey & now it was time to get the party started, specifically it was time to throw the garter belt (that’s us above). 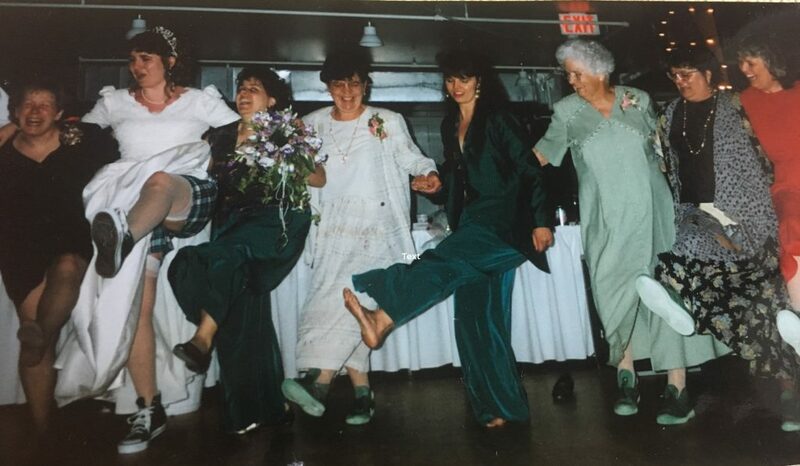 Imagine a room filled with family & friends, gathered round, waiting for Doug (my new hubbie) to throw my garter belt. To some of our more conservative family, this would be a normal & welcome tradition. However to our more activist friends & family (including my new mama-in-law), this would be an unwelcome, sexist ritual. What’s a bride to do? Think outside the garter of course. I cued the previously prepped DJ & ‘You can keep you hat on’ started playing. In my traditional long gown, as the sultry music filled the room, I shimmied, shook & sidled up to my surprised hubbie. His eyebrows shot up as high as the ceiling but he was game. Just before I settled into the proffered chair so he could remove my garter belt, I suddenly hoisted my long gown above my waist & revealed green plaid boxers & green high tops. Out of the corner of one eye I see Doug’s mom cheering wildly. And as I sit down, I notice movement behind me. I turn around & my jaw drops to the floor. Everyone howled, the conservatives & the activists. Bringing us to the present day, my new website is almost ready. I’ve got new ways to serve you, both in person & online. I’ve got some fun surprises & creative ways for you to get involved (fortune telling anyone?). A marriage of tradition & new, of bringing together worldviews. Rock.Paper.Scissors Inc. started as an improv entertainment company, then included training when I came onboard. Now it’s a fully learning & development (training company). My amazing business partner & gifted comedian, Diana Frances, has gone on to other things, focusing on her writing. I won’t forget the lessons I learned from her & other improvisers about the strategic uses of humour & creativity. See if you can apply some of my lessons to a situation you’re facing where you need to amp up your creativity. What can you marry together? See you next week with a whole new look & a brand new website.